Interests - Melissa loves puzzles, painting, crafts, stickers and anything sparkly. Melissa adores princesses and dressing up, her favourite princesses are Belle, Rapunzel and Ariel. She is really into a Japanese anime film called 'My Neighbour Totoro'. She loves going to the park, rain or shine. She has always liked Dora the Explorer. Melissa loves dancing, she does Ballet and Zumba. Favourite Colour - Pink, yellow and purple. Visually/hearing impaired? - Yes - Melissa was born deaf but can now hear almost normal levels. Melissa has had a very difficult start in life. She was born 8 weeks prematurely and shortly after was diagnosed deaf. 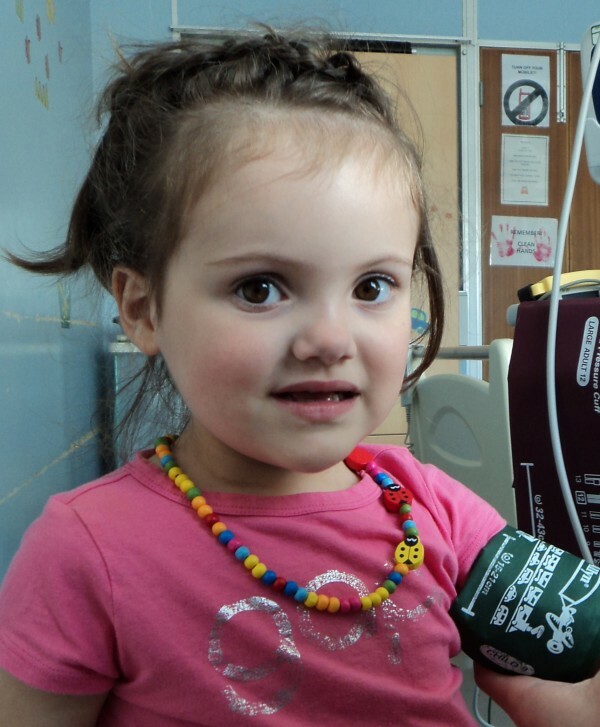 When Melissa was 13 months old, she was diagnosed with Acute T-cell Lymphoblastic Lymphoma. She has had many setbacks, including Gulliain Barre Syndrome, which left her paralysed from head to toe. She has now learnt to walk again for the third time. She has also gained some hearing, which is great news. She is a very brave little lady who keeps amazing us every day. Melissa is now ready to move on from Post Pals and give the chance to some one else. We have loved being a part of your fab charity and have made some life long friends, for sure! Thank you for all you do and our post and we will keep writing to Pals in the future!! Melissa’s scans were all clear, but they are concerned about her getting respiratory problems so easily. They started her on I.V. immunoglobulins again to boost her immunity. She is not a very big fan of the cannulas, but she is a very brave little girl. She knows that she needs the medicine to make her better! Melissa loves getting mail. She has been getting letters all over the world lately; she had some from Netherlands, USA, Japan, Finland! Melissa speaks Finnish, so if anyone from Finland sees this, feel free to write in Finnish! Melissa loves the Moomins, especially Niiskuneiti and Pikku Myy. Melissa has been doing very well, but we’ve started to see what the long term effects of chemo can be like. Melissa’s teeth are not doing well, and she probably has to have quite a few pulled out. She has an appointment in few weeks to see what the plan will be. She is down to just one daily medication now which is awesome! She will have some scans on the 20th and we are of course hoping that all looks clear!! I just wanted to let you all know that Melissa has been so happy with all the lovely mail!! She recently had an awful day in the hospital… she had GFR, IV immunoglobulins (had a very bad reaction), DNA testing, she had 2 cannulas and 1 butterfly put in for all the bloods… and she was very brave, but it really was a long day. It was so nice to come home, because there was some really lovely mail waiting for her, including a flying fairy!! She was just sooo happy and soon forgot all about the terrible day spent in the hospital. Thank you so much for all you do, you have made my girl smile so many times already, it is truly wonderful to see. Melissa is now home, but still keeps having temp spikes. They weren’t able to find out what’s making her poorly. Thank you ever so much for all the letters, cards and gifts, they have really cheered her up, especially during our latest hospital stay. Melissa loves getting mail!! Melissa loved all the cards; she even got one from New York!! She also got one that was completely blank! Melissa absolutely adores her My Little Ponies and all the stickers have found a place. They’ve been so nice to have when we’ve been in the hospital; she has made lots of art! Thank you so much for all that you do, you’ve made my girl smile so many times already! Melissa has been in hospital for few days now with a very high temp (over 41c). Doctors can’t figure out what’s making her poorly. She has been sick once a month like this since Christmas. She has a very hard time breathing and she is breathing 80 respirations/minute. Hopefully antibiotics will work as we’d love to have her home soon!